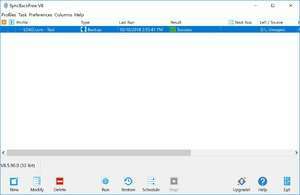 SyncBack is a freeware backup utility which can save your backed up data to several different mediums including FTP sites, ZIP files, network hard drives and more. SyncBack includes many different free features and comes with a long list of different configuration options. SyncBack can automatically close programs when performing its backup operations, features a very user-friendly easy mode and can perform basic restore and backup operations without much PC knowledge. Help files included with SyncBack are very comprehensive and comes with support for most of the world's highest-used languages. Version 8.6.3.0 is a freeware program which does not have restrictions and it's free so it doesn't cost anything. For security reasons, you should also check out the SyncBack download at LO4D.com which includes virus and malware tests. Additional screenshots of this application download may be available, too. SyncBack has a presence on social networks. SyncBack download been highly rated by our users.